Bridgewater has plenty of athletic ability and upside so it will be interesting to see how he develops over the next 2-3 years. 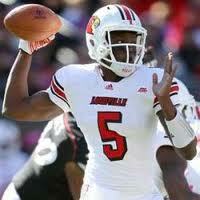 Teddy Bridgewater, QB, Louisville: Bridgewater has a live arm, has flashed solid accuracy and pretty good mobility. He has a long way to go as far as the craft of playing quarterback, but has plenty of upside and potential thanks to his physical ability. All depends on how hard he works and how much film he watches. He has the size and athletic ability to be a very effective college quarterback and like many athletic quarterbacks he has a great ability to improvise and make special plays outside the pocket as Bridgewater displayed in this game. However, he also turned the ball over too much in this game because of an opportunistic NC State defense. He has a bright future in college and this experience will really help him next year in my opinion, but it’s up to him whether or not he develops into a great passer with great athletic ability or whether he continues to be a great athlete than can also throw the ball. Right now he is the latter. Victor Anderson, RB, Louisville: Anderson is an athletic player but because of his lack of size and his problems with injuries I would be surprised if he was drafted. I think he will get signed as an undrafted free agent, but I think teams will want him to prove that he can stay healthy and will want him to earn his spot on their roster. He’s fast but I don’t think he has feature back potential, rather he will be more of a 3rd down back that also offers some value as a return man. He’s fast and versatile, but ultimately his potential in the NFL is tied to whether or not he can stay healthy. Michaelee Harris, WR, Louisville: Harris is a freshman receiver that will likely be developing along with Bridgewater. Considering his production of 35 receptions, 438 yards and 2 TD’s as a 6’2”, 198 pound freshman it seems that Charlie Strong and Louisville have a pretty bright future ahead of them. I didn’t see much of him in this game, but Louisville has a lot of young talent that has gotten playing time this year so watch out for these guys as they continue to develop. Charlie Strong sure is a good recruiter. Eli Rogers, WR, Louisville: Rogers is another talented freshman receiver for Louisville. He is shorter as he stands at 5’10”, 185 pounds but he still produced 34 receptions, 400 yards and 1 touchdown on the season. Harris, Rogers and DeVante Parker figure to give Bridgewater an impressive trio of receiving options for the entire duration of his career, so watch out for these four guys as they all grow up with one another through the years. I’m not sure I’ve ever heard of so many freshman playing year one like these guys have for Louisville and producing! 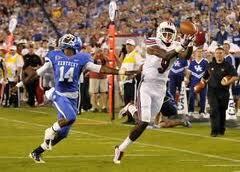 DeVante Parker produced the most touchdowns of anyone on Louisville this year as a freshman. I really like his upside. DeVante Parker, WR, Louisville: Parker had the lowest production total in terms of receptions and yards of the three freshman but at 6’3”, 196 pounds he may be the best red zone target. He managed 17 receptions, 276 yards and 6 touchdowns on the season. His 6 touchdowns led the team this season, which is quite impressive for a freshman receiver. He flashed both his upside and some things he has to work on in this game as he dropped a pass that hit his hands over the middle of the field but also demonstrated his red zone viability by climbing the ladder, high pointing a pass and hauling it in just out of bounds. Had he gotten a foot down it would have been a score. He’s got a lot of upside, so I’m excited to watch him for the next few years. Josh Chichester, TE, Louisville: Chichester is the 6’8”, 240 pound monster tight end for Louisville. You’d think he’d be more dominant than he actually is at that size, as he struggles as a blocker because of his issues with pad level and leverage. He’s a viable receiver, but doesn’t have much speed to threaten teams down the seam. He’s very much a possession tight end and some team will be intrigued by his size and his pretty reliable hands and draft him in the 6th or 7th round in my opinion. Mario Benavides, C, Louisville: Benavides had a good game for Louisville and figures to be one of the top centers in the 2013 draft class. He will be a senior next year and at 6’4”, 300 pounds he absolutely has NFL size as a center. I am excited to scout him next year because I was very high on a former Louisville center that ended up going in the 1st round in Eric Wood. I won’t say Benavides will do the same, but I liked what I saw in this game and I think he has the potential to go in the first three rounds next year. Marcus Smith, DE, Louisville: Marcus Smith will be a junior next year but during his sophomore season he was a 6’3”, 251 pound pass rush specialist. Five of his 10 tackles on the season were for loss, but all of them were sacks! He also had a forced fumble and a pass break-up and he demonstrated ability to get pressure with his burst and edge speed. He worried me by not showing much bend or hip flexibility though, so I will need to see more of him next year. Greg Scruggs, DT, Louisville: Scruggs was a guy that I identified last year as a possible mid-late round 2012 draft pick but he was a possible late round prospect all year before this bowl game. The 6’4”, 285 pound senior didn’t end up playing in this bowl game as a result of a suspension stemming from a DUI. That really is too bad, but it was his own decision to drink and drive between the end of season and his bowl game. It’s never a good time to drink and drive, but this DUI will likely mean he will go the entire draft process without hearing his name called barring unforeseen changes. That’s too bad, but it was his decision to drink and drive. William Savoy, OLB, Louisville: Savoy is an undersized defensive end that is going to have to attempt a transition to outside linebacker. I’m not sure he has the athleticism to make the move, but he has pretty good burst and edge speed as a pass rusher and more importantly displayed the ability to bend to beat blockers with an outside rush. He had 7.5 TFL and 5.0 sacks this year, but I think a postseason all star game could be very important for him as he attempts to transition to outside linebacker. Dexter Heyman, OLB, Louisville: Heyman was probably Louisville’s best defensive player this year as he totaled 83 total tackles (52 solo), 15.5 TFL, 4.0 sacks, 3 INT’s, 1 forced fumble and 1 pass break-up on the season. He has solid NFL size for a linebacker at 6’3”, 238 pounds and has a listed 40 yard dash time of 4.57. I need to watch him more, but he certainly flies around for Louisville’s defense. Mike Glennon flashed some significant potential in this game. It's not easy to follow a quarterback as successful as Russell Wilson, so I look forward to evaluating him as a senior next year. 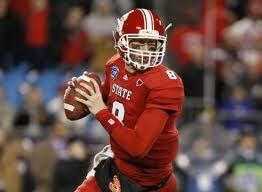 Mike Glennon, QB, NC State: Glennon had a tough job this year replacing Russell Wilson at quarterback for NC State. Wilson isn’t an easy guy to replace as Wisconsin will find out next year, but I think most Wolfpack fans expected to have him back for a final run at an ACC title. That didn’t pan out, but Glennon stepped up and really finished this season strong. He’s listed at 6’4”, 225 pounds and was very effective this year in his first season as a starter. He’s got a live arm and showed that he can make all the throws in this game and his ball placement was pretty good, especially on short and intermediate passes. 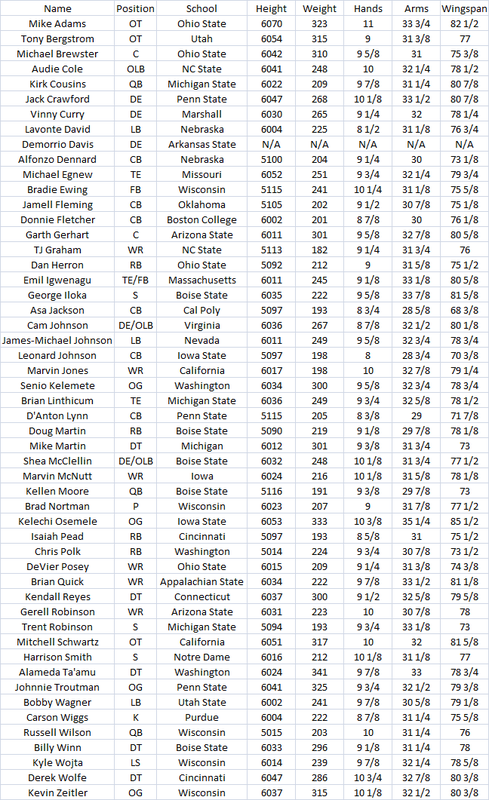 His long passes weren’t quite as accurate, but obviously those are some of the most difficult throws to make. There were a number of wide receivers that were pretty open thanks to Louisville’s less than spectacular zone but he made some stick throws that were impressive. He didn’t have as much success in the 2nd half as he did in the 1st half by any means, but he still has some upside to build off of for next season. I didn’t watch him much this year, but I was a little troubled by his issues to move the ball through the air in the 2nd half, especially since NC State’s running game was fairly insignificant as usual. He will be a senior next year so I am interested to see how he will develop and improve on his first season as a starter. T.J. Graham, WR, NC State: Graham definitely surprised me with his ability in this game, I didn’t expect him to have the finish to his career that he did. He demonstrated all of his upside in this game by showing burst, speed and vision as a kick returner as well as great speed to threaten defenses vertically and pretty reliable hands. He is only listed at 6’0”, 180 pounds but his fantastic speed both on the field and in the 40 yard dash (he has a listed 40 time of 4.36) should push him up some teams’ boards, especially after he participates in an All-Star game and the combine. He also showed the ability to make guys miss with his elusiveness and even broke a couple of arm tackles in this game. He’s definitely a sleeper, so it will be interesting to see where he ends up going. George Bryan, TE, NC State: Bryan is a late round TE prospect with NFL size (6’5”, 265 pounds) but he’s quite slow and has a listed 40 yard dash time of 5.14. He uses his body well to shield defenders and offers some value as a blocker but his hands aren’t as reliable as you would want them to be given some of his struggles to create separation. He’s got the frame to shield defenders away from the ball to make catches in traffic and I think his hands are above average but I wouldn’t call them good or great. That makes me wonder how effective he will be if he struggles to create separation and has to make a lot of contested catches in traffic, and that hurts his stock in my opinion. R.J. Mattes, OT, NC State: Mattes is a quality left tackle prospect for the 2013 draft. I don’t think he should declare this year but he’s got mid-round or higher potential for next year’s draft. He’s 6’6”, 306 pounds and seemed to have pretty long arms and solid athleticism. He looked like he may have been NC State’s top offensive lineman so he is one guy I will be keeping an eye on. Camden Wentz, C, NC State: I was looking forward to evaluating Wentz but he got injured early in the game and never got back in from what I could tell. He will be a senior next year and seems like he has draftable ability as a center in addition to his 6’3”, 301 pound frame. The injury wasn’t serious if I remember correctly, so he should be 100% well before spring practice. Daryl Cato-Bishop, DE, NC State: Cato-Bishop is a 6’4”, 281 pound defensive end who was a sophomore this season. He didn’t have a lot of tackles but he did have 7.0 TFL, 5.5 sacks, 1 FF, 1 INT and a pass break-up. He’s got impressive size for a defensive end, so it will be interesting to see how he develops next season. He was around the ball consistently in this game, so I think he has some upside. Art Norman, DE, NC State: Norman was a freshman defensive end this year and is undersized at 6’1”, 242 pounds but as a situational pass rusher he produced 7.5 TFL, 4.5 sacks, 1 FF and a pass break-up this year. I didn’t have much opportunity to evaluate his edge speed or his burst off the line of scrimmage, but he got some playing time as a freshman so I will be keeping an eye on him the next couple of seasons. He’s another talented freshman on Charlie Strong’s roster. J.R. Sweezy, DT, NC State: Sweezy didn’t have a great statistical season but he does have one of the best names in this entire draft class. I kind of hope he gets picked by a team in California so he can become close friends with Snoop Dogg. Random thoughts aside, he has NFL size at 6’5”, 293 pounds but I honestly haven’t seen him play much at all. He had 19 total tackles (10 solo), 4.0 TFL, 2.0 sacks and 1 FF this season but remains a mid-late round pick right now. It will be interesting to see if he distinguishes himself in an all-star game, but right now I don’t know much about his game. Audie Cole, LB, NC State: Cole is a senior linebacker on NC State and I really love watching him play. He had a great season with 98 total tackles (52 solo), 8.5 TFL, 3.5 sacks, 4 FF, 1 FR and 4 pass break-ups. He’s got a fantastic motor, gives 100% on every play and he is a good tackler which I love to see. So many players I’ve watched this year don’t tackle with good fundamentals, so it is always refreshing to see a player who wraps up. Cole is a 6’5”, 239 pound linebacker who moved inside this year but I think he could play outside as well. His versatility will help his stock though, and while he doesn’t have elite timed athleticism he does seem to have good range and instincts. His effort will be the big difference for him though, and that will help him get the most out of his ability. Terrell Manning is a quality linebacker prospect that caught me off guard by declaring early for the NFL Draft. Terrell Manning, OLB, NC State: Manning is another talented linebacker on NC State but to my surprise he has declared for the NFL Draft. He’s only a junior and I hadn’t heard much about him leaving, so it definitely caught me off guard a bit. He was productive at outside linebacker this year as he produced 70 total tackles (42 solo), 13.0 TFL, 5.5 sacks, 4 FF, 1 FR, 5 PBU’s and 2 interceptions. He looked like a beast to me and seemed to have impressive instincts, athleticism and looked like a very good tackler. I didn’t evaluate him much when he was dropping into coverage, but for a 6’3”, 233 pound linebacker he seemed to defend the run awfully well. I don’t know how well he will be able to stack and shed blocks to make plays at the line of scrimmage. I like his upside, but I was anticipating having another year to evaluate him. I’ll have to go back and watch more NC State film to get a better look at him. David Amerson, CB, NC State: Amerson was probably the best NFL prospect in this game even if he isn’t eligible for the draft as far as I am aware. He is a 6’3”, 194 pound sophomore cornerback who had an astounding 13 interceptions this season. That’s more than some football teams got all year, but he managed to do it individually. He wasn’t often challenged, and one of his two interceptions in this game came on a hail mary late in the game, but he did have a second touchdown off of an interception on the season which helped change the game in favor of NC State. I always look for players who make critical plays that change the game in their teams favor and Amerson definitely did that against Louisville. If he has a season even remotely as impressive as this one was I would expect him to declare next year, but even if he doesn’t produce the same statistics next year I think he may declare. I wouldn’t be surprised if more teams threw away from him more often next year now that he has proven himself. Keep an eye on this kid, he has top 15 written all over him. Thanks for reading! I’ve had this done for a couple days but my trip to the Rose Bowl interfered with posting it until now. Look out for my Florida State-Notre Dame post and a Rose Bowl recap, all coming soon! 6’3”, 205 lb Fr. 167/253 (66% comp), 1,855 yards (7.3 YPA), 12:9 TD:INT, 95 rush yards, 3 TD’s. 6’2”, 221 lb Soph. 131 attempts, 482 yards (3.68 average), 4 TD’s. 14 rec, 95 yards, 1 TD. 6’2”, 198 lb Fr. 35 receptions, 438 yards (12.51 average), 2 TD’s. 5’10”, 185 lb Fr. 34 receptions, 400 yards (11.76 average), 1 TD. 54 PR yards. 6’3”, 196 lb Fr. 17 receptions, 276 yards (16.24 average), 6 TD’s. 6’8”, 240 lb Sr. 27 receptions, 365 yards (13.52 average), 2 TD’s. 6’3”, 251 lb Soph. 10 total tackles (8 solo), 5.0 TFL, 5.0 Sacks, 1 FF, 1 Pass break-up. 6’4”, 285 lb Sr. 19 total tackles (12 solo), 6.0 TFL, 4.0 sacks, 1 FF. 6’1”, 246 lb Sr. 24 total tackles (12 solo), 7.5 TFL, 5.0 sacks, 1 kick blocked. 6’3”, 238 lb Sr. 83 total tackles (52 solo), 15.5 TFL, 4.0 sacks, 3 INT, 1 FF, 1 PBU. 6’4”, 225 lb Jr. 262/420 (62.4% comp), 2,790 yards (6.6 YPA), 28:11 TD:INT ratio, -125 rush yards, 1 TD. 6’0”, 180 lb Jr. 212 att, 852 yards (4.02 avg), 7 TD’s. 39 rec, 300 yards. 5’11”, 175 lb Jr. 35 receptions, 448 yards (12.80 avg), 4 TD’s. 6’5”, 265 lb Sr. 30 receptions, 302 yards (10.07 avg), 4 TD’s. 6’4”, 281 lb Soph. 21 total tackles (11 solo), 7.0 TFL, 5.5 sacks, 1 FF, 1 INT, 1 pass break-up. 6’4”, 303 lb Sr. 42 total tackles (22 solo), 8.0 TFL, 3.5 sacks, 3 PBU’s, 1 Kick Blocked. 6’5”, 293 lb Sr. 19 total tackles (10 solo), 4.0 TFL, 2.0 sacks, 1 FF. 6’5”, 239 lb Sr. 98 total tackles (52 solo), 8.5 TFL, 3.5 sacks, 4 FF, 1 FR, 4 PBU’s. 6’3”, 233 lb Jr. 70 total tackles (42 solo), 13.0 TFL, 5.5 sacks, 4 FF, 1 FR, 5 PBU’s, 2 INT’s. 6’3”, 194 lb Soph. 54 total tackles (37 solo), 1.0 TFL, 5 PBU’s, 11 INT’s (1 TD). 6’2”, 210 lb Jr. 77 total tackles (37 solo), 2.5 TFL, 5 INT’s, 1 FF, 1 PBU.